Every spring in Japan, families with sons set up samurai armor displays so that their boys grow up to be healthy, strong, and understand the true power of the Force. Wait, what? This is called a “gogatsu ningyou” (五月人形) or “May Doll.” It’s about two or two-and-a-half feet tall (which gives you an idea of its size). There are also displays that only feature the samurai helmets. They have nothing to do with Star Wars! The katana represents strength, while the bow and arrow represents a straight path to success. Of course, both were also weapons carried by samurai. 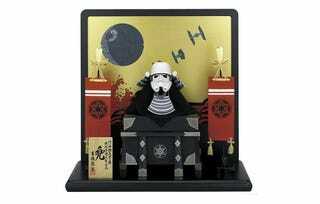 Recently, Matome Naver reported that Japan now has Star Wars themed yoroi, which even uses the Imperial emblem as the kamon or traditional coat of arms. These Empire-themed May Dolls, however, were first launched a few years back. These displays are not cheap. The Darth Vader suit of armor costs over 350,000 yen or US$2,929, while the Vader and Stromtrooper helmet displays are close to 200,000 yen ($1,674) each. Amazon Japan and Toys R Us still has some in stock, but May Doll seller Yoshitoku says the Star Wars themed ones are sold out. Because Star Wars has been so influenced by Japanese culture, these dolls do make sense. Though, not sure if parents really want their kids to grow up to be Darth Vader—or worse, a Stormtrooper.